Colm Tóibín is a writer I know a fair bit about yet have never properly read. Until now, that is (one of the great benefits of taught literature modules being that you must read writers you’d otherwise skate around). When researching my blog article about novels set in Barcelona before moving there, Tóibín was right at the top of every Goodreads list or Guardian top-ten article. His non-fiction guide to Barcelona, Homage to Barcelona, is a book that I’ve meant to read (much like Orwell’s Homage to Catalonia that the title nods to) but never got round to, despite some encouraging flicking through pages and browsing contents. Perhaps this explains why I didn’t make the link between the Tóibín who celebrates Catalan culture, and the Irish-born Tóibín who plays an integral part in my Irish literature studies. These two sides of the author seemed to be so different – such unlikely parallels in a way – yet finally drawing a line between the two has been fascinating. 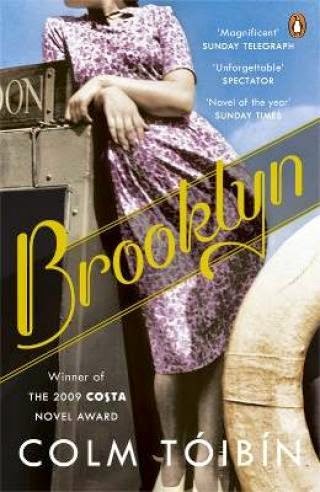 Reading Brooklyn (Tóibín’s 2009 novel) was a wonderful experience to kick this off, and I’m enjoying all there is to learn about the author’s multi-faceted, complex body of work. The novel centres on Eilis Lacey, a young woman living in small-town Ireland in the 1950s – a space in history where opportunities were few, particularly for women. Eilis is quiet and completely lacks all assertion, particularly when standing against Rose: her confident, fashionable and sociable sister. However, with the help of an Irish priest from Brooklyn, Eilis is the one to make the transatlantic journey to America, not Rose. What follows is a beautiful story of self-transformation, the complexities of romance, and the realities of homesickness. If you’re often reserved and a little shy, or you struggle escaping your comfort zone, you will probably see something of yourself in Eilis. She is frustratingly passive at times, and all readers are likely to shout at her to just do something at one stage or another, but there’s something very relatable about her. Having been accustomed to living in the shadow of her confident sister, Eilis’s relocation to Brooklyn changes everything. She becomes the centre of attention (albeit a very foreign one), and after a period of homesickness and displacement, she starts to shape her own identity. Eilis takes up an evening class in accounting, and retreats to her books at the end of the day. She also meets Tony, a loveable Italian who distances her character even further from the ‘old Eilis’. However, her family ties pull her back to Ireland and we’re left to see if her life in Brooklyn – and her new identity – can sustain itself. The plot is directly influenced by Tóibín’s own time living in Barcelona during his twenties – a direct parallel with my own life that must have coloured my reading of Brooklyn in more ways than one. A Pride and Prejudice of the 1950s? In the early stages of the novel, we come across a scene that alerts the intertextual senses of every keen reader. Eilis is at an evening dance, standing with a female friend, and they approach two men. George is warm and friendly, but his friend, Jim, is decidedly not: he is rude, dismisses her offer to dance, and creates a lasting impression as a character to avoid. That is, if you haven’t read Pride and Prejudice. This is a Mr Darcy figure if ever there was one. Connections to Pride and Prejudice can be picked up on throughout the book, although it’s worth considering if Eilis really fits the bill as an Elizabeth Bennett figure. I’d like to think so, but it just doesn’t seem like a comfortable fit. Do, however, look out for the Lady Catherine de Bourgh and the Bennett sisters. Perhaps my newfound interest in Tóibín’s writing will be confined to Brooklyn, although it won’t hurt to read a few of his other novels before I make up my mind. I’m currently reading The South (Tóibín’s first novel that’s set in Barcelona), which doesn’t quite seem to have the same magic, but I haven’t given up just yet. The Master – a fictionalised biography of sorts of Henry James – seems fascinating. Surely one of the most rewarding elements of reading is coming across a new author and delving into their body of work. This sounds really good and the Pride and Prejudice connection is fascinating. I have a lot of ties to the place. I adored this novel when I read it a few years ago, Lucy, and it found its way on to my Favourite 12 of 2012 list. So glad that you enjoyed it as well. It was my first Toibin although I was familiar with him from interviews i'd heard, and he is from Enniscorthy in County Wexford where I have relatives and where I spent some time visiting whilst backpacking after finishing my undergrad. I loved reading about Enniscorthy in the novel. His depiction of homesickness is the best I have ever read. I never understood exactly how he accomplished it, but having lived away from my family I could really identify with that aspect of Eilis's life. Such a good reminder about the dangers of drifting along in life without a plan!